This book is a stylistic study of D. H. Lawrence's presentation of narrative viewpoint. The focus is mainly on Lawrence's third novel, Sons and Lovers, occupying a crucial position in his oeuvre and judged by critics to be his first mature piece.While sharing many features typical of nineteenth-century novels, it marks the emergence of a new technique of writing consciousness that functioned as a… precursor to the modernist practice of dialogic shifts across viewpoints. Through a detailed linguistic analysis, Sotirova shows that different characters' viewpoints are not simply juxtaposed in the narrative, but linked in a way that creates dialogic resonances between them. The dialogic linking is achieved through the use of devices that have parallel functions in conversational discourse - referring expressions, sentence-initial correctives and repetition. 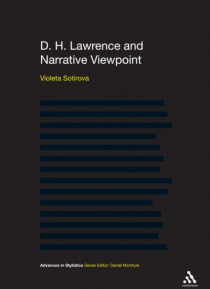 The book uses stylistics to resolve current controversies in narratology and Lawrence criticism.In approaching the study of narrative viewpoint from the angle of discourse, Sotirova arrives at cutting-edge insights into Lawrence's work. This book will be required reading for stylisticians, narratologists, literary linguists and literary studies scholars.